NOTE: All of the programs once again this month feature recordings that are part of the expanded Naxos Distribution family. A rarely-heard Swiss composer, the great Englishman Thomas Tomkins, and madrigals of madness at the turn of the 17th century. I. Madrigals of Madness (Calmus Ensemble). Carus CD 83.387. The Calmus Ensemble presents madrigals of the 16th and 17th centuries on this CD, which includes masterpieces by Gibbons, Flecha, Monteverdi, Gesualdo and Josquin des Prés. This CD initiates a larger series of recordings featuring the Calmus Ensemble: In the coming years they will record various madrigal programs dealing with the different emotions. 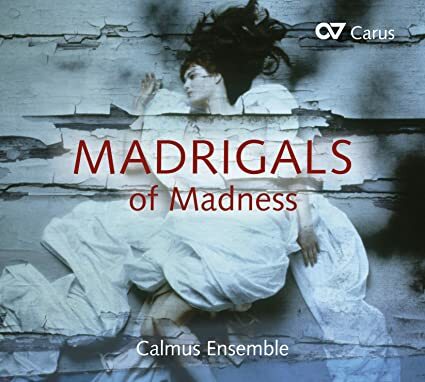 "Madrigals of Madness" marks the start of this undertaking, and takes as its theme, as the title indicates, the subject of madness, as it is encountered in love, war or loneliness – this is a complex theme which Calmus expresses masterfully and convincingly with high emotionality. The CD-Booklet expands the musical exploration of this theme from a medical point of view through an interview with a psychaitrist. II. Thomas Tomkins—When David Heard: Sacred Choral Works (Choir of St. John’s College, Cambridge/Freddie James, organ/Andrew Nethsingha). Chandos Chaconne CD CHAN 0804. From AllMusic.com: Thomas Tomkins worked well into the 17th century, his public career coming to an end only in 1642 as a result of England's Civil War, and organ works for his own use (such as the unique A Sad Pavan for Distracted Times, heard here) were written even after that. His music reflects no trace of the Baroque procedures that were well entrenched by then, even in England, but to call him conservative, as is so often done, misses the point even though it is technically accurate. Tomkins wrote quite a few madrigals in a style not that far from Thomas Morley's (the two were both students of William Byrd). His sacred music, not often recorded and nicely represented here, is uniquely madrigalian, often with an intensely emotional response to the text that's rare even in the works of the Italian mannerists. Did he get that from the Baroque, or was it simply his own musical personality? Either way, a piece like the magnificent When David heard that Absalom was slain (track 1) has few counterparts in English sacred music, and the whole program ought to be heard more often than it is. Director Andrew Nethsingha understands that a classically impersonal English collegiate choir sound is not what is called for here, and he molds the Choir of St. John College, Cambridge, into a very expressive instrument. When David heard that Absalom was slain, for example, is given a hushed, genuinely tragic atmosphere, and the choir's emotional range under Nethsingha is impressive. There are British choirs with greater pitch precision in complex high-up textures, but in general this is a collection of Renaissance polyphony that's both beautiful and often very moving. III. Musik der Benediktiner—Valentin Molitor Motteten (1683). (Basler Madrigalisten/Musica Fiorita/Daniela Dolci). Pan Classics CD PC 10313. The Epinicion Marianum (“Song of Praise to the Virgin Mary”) by Valentin Molitor, published in 1683, contains a total of 18 motets. The collection comprises music for six feasts of Our Lady of the liturgical calendar. Two five-part motets and a solo motet were intended for each feast, always with two obbligato violins and other instruments ad libitum. On this recording a selection of pieces for all feasts can be heard. The volume was probably published on the occasion of Molitor’s appointment as First Cantor of St. Gallen Monastery where the use of instruments in the liturgy was particularly restricted. Beginning in 1645, performing concertante music was only permitted at special festivities. 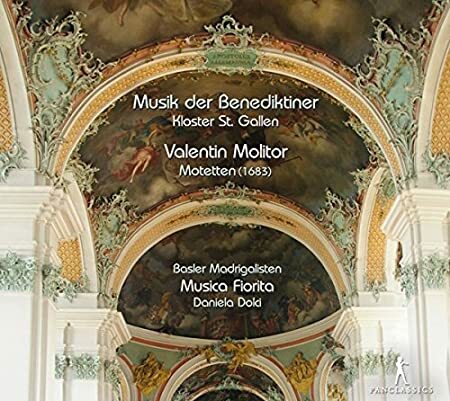 Father Molitor appears to have counteracted this conservative tendency: the first collections of a local composer written in concertante style, as well as the first to be printed at the Monastery. The harpsichordist and leader of the ensemble Musica Fiorita, Daniela Dolci (a native of Sicily), studied early music at the Schola Cantorum Basiliensis in Basel, specialising on historical keyboard instruments. Subsequently she went to Amsterdam for further training with Gustav Leonhardt. Her main focus — is the historical basso continuo practice, based on 17th and 18th century sources. Valentin Molitor Motteten (1683), Thomas Tomkins, Orlando Gibbons, Thomas Tomkins, Clément Janequin, Josquin des Préz, Mateo Flecha, Carlo Gesualdo di Venosa, Claudio Monteverdi. Carus CD 83.387, Pan Classics CD PC 10313, Chandos Chaconne CD CHAN 0804.